TriageNow participated in another community service project, this time with the “Feed My Starving Children” program. 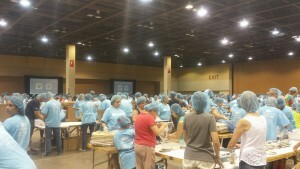 Phoenix is the home of a full time program office for FMSC, and they have sent food boxes to over 70 countries around the world. We were proud to step up and assist in this 501(c)3’s efforts which help so many others. A very worthwhile way to spend a Saturday afternoon! Feed My Starving Children works with multiple charities and organizations around the world, including Action International, International Children’s Fund, Reach Now, and World Help International among many others. This organization has grown year over year by an annual average of 48%, so we were happy to lend a hand to assist in their efforts. We look forward to serving our community and the rest of the world at our next opportunity! Contact us to learn more or how your company can get involved. Some of the TriageNow crew in action! The results are in!!! 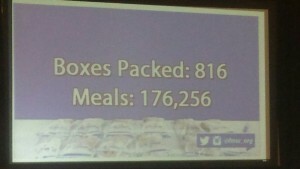 A new record for FMSC was set during our session.